My first post in 2015 is a double! Featuring two photographs taken at the same time but featuring different poses. 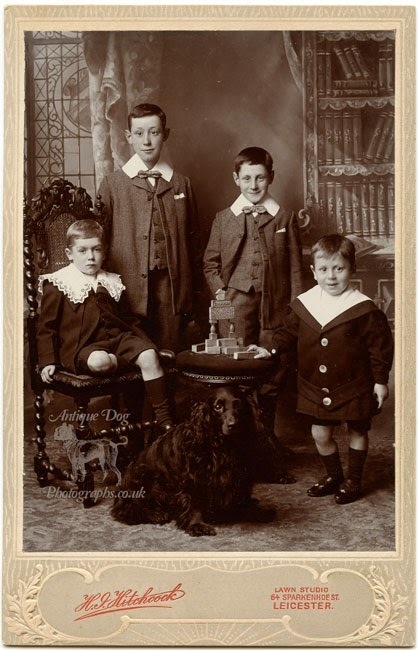 In the first photograph four brothers pose together with their Cocker Spaniel- some of the brothers look more pleased to be having their photographs taken than others! Note the carefully arranged wooden building blocks on the table in the centre of the image. 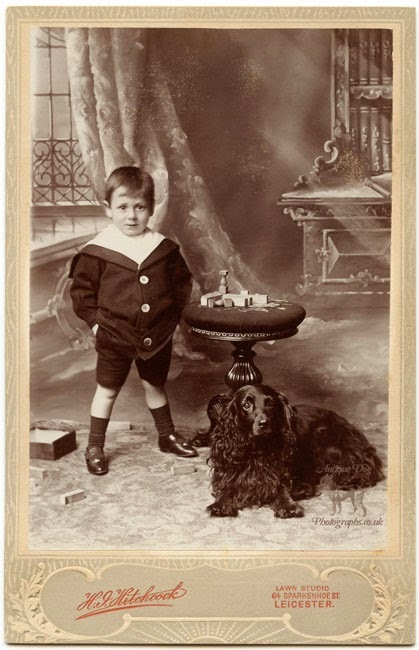 In the second photograph the youngest (and most fidgety) of the brothers is posed on his own with the Cocker. This little boy obviously wasn't happy with the arrangement of the building blocks, having knocked them down and spread some of them on the floor as well! This dark coloured Cocker certainly could do with a trim! The dog's face is narrow and quite delicate, and from this I would think it not unlikely that it is a female. Photographer Henry Jonathan Hitchcock was born in Leicester in 1869. He married his wife Edith Mary Smith in October 1895 and they had two daughters. Henry opened his photographic studio in the family home at 64 Sparkenhoe Street in Leicester in 1899. My photographs date from circa 1902 when Hitchcock began using the name "Lawn Studio" which you can see on the mount of the photographs. Want more Spaniels? 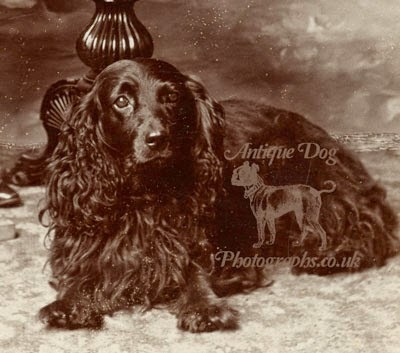 Click here for my other Spaniel related articles on this website. Henry Jonathan Hitchcock in the 1881 England Census [database on-line].